I've put together a list of burial places of people who influence Black Paris history. Should you find yourself near any of the below mentioned sites in America, Europe or Africa, remember who rests there. Eugene Bullard - buried in full military honors in his legionnaire uniform in the Cemetery of the Federation of French War Veterans section of the Flushing Cemetery, Queens. James Reese Europe - Arlington National Cemetery. Sally Hemings - allegedly at a site in downtown Charlottesville VA, now covered by a parking lot of the Hampton Inn on West Main Street. Booker T. Washington - on the Tuskegee University Campus Cemetery of Tuskegee near the University chapel, AL. Frederick Douglass - Mount Hope Cemetery, Section A, Rochester NY. Mary Church Terrell - Lincoln Memorial Cemetery. Victor Sejour - Père Lachaise Cemetery, Section 15, Paris. 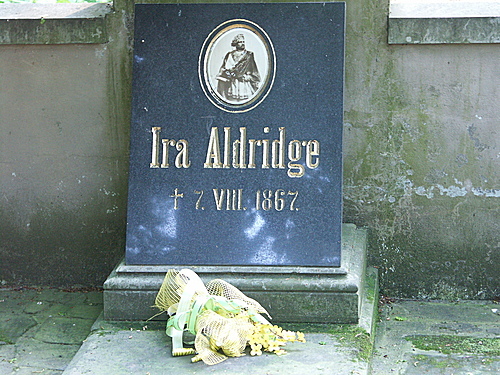 Ira Aldridge - Lotz Evangelical Cemetery, Lotz Lodzkie, Poland. Langston Hughes - ashes interred beneath a floor medallion in the middle of the foyer leading to the auditorium named for him within the Arthur Schomberg Center for Research in Black Culture, Harlem. 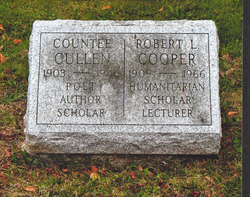 Countee Cullen - Woodlawn Cemetery, Bronx NY. Claude McKay - Woodside, Queens County NY, Plot: Second Calvary, Section 42, Plot R. Grave 5. Lois Mailou Jones - Oaks Grove Cemetery, Dukes County MA. Hale Woodruff - Mount Hope Cemetery, Topeka, Kansas. Archibald Motley - Cook County Cemetery, Dunning, Cook County, IL. Beauford Delaney - Cimetière Parisien de Thiais, Paris. Henry Ossawa Tanner - Cimetière de Sceaux, in south Paris, Division 8. Hugh Lawrence (Larry) Potts - Thiais Municipal Cemetery, ashes strewn over the Jardin de Souvenir (Garden of Remembrance). James Baldwin - Ferncliff Cemetery and Mausoleum, Westchester County, NY. Plot: Hillcrest A. Grave 1203. 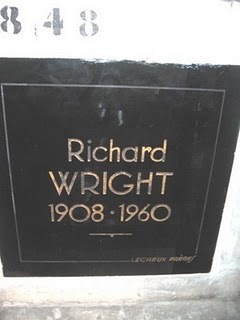 Richard Wright - Père Lachaise Cemetery Columbarium, Paris. William Gardner Smith - initially in Père Lachaise Cemetery Columbarium, but his remains are now scattered over the Jardin de Souvenirs (Garden of Remembrance) in Section in Division 77. Chester Himes - Cementeri de Benissa, Alicante, Valenciana Spain. 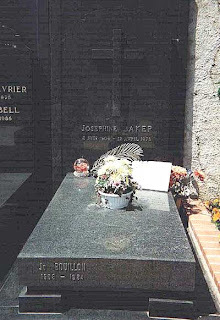 Josephine Baker - Cimetière de Monaco, Monaco France. Ada ‘Bricktop’ Smith - Woodlawn Cemetery, Bronx. Nina Simone - Ashes scattered in several African countries. Paul Robeson - Ferncliff Cemetery, Hartsdale Westchester County, NY. James Arthur Briggs - Montmartre Cemetery, Division 9. Sidney Bechet - Cimetière de Garches, west Paris, Division G.
Malcolm X - Ferncliff Cemetery and Mausoleum, Hartsdale, NY. Alexandre Dumas - The Pantheon, Paris. René Maran - first Black writer to win the French Prix Goncourt (1921 Batouala), Montparnasse Cemetery, Paris. Leopold Senghor - poet, politician, first president of Senegal, one of the founders of the Negritude Movement, in Bel-Air Cemetery, Dakar, Senegal. Leon-Gotron Damas - poet, politician, and one of the founders of the Negritude Movement, buried in his native French Guyana. Aimé Cesaire - poet, politician, one of the pioneers of Negritude black consciousness Movement, in Fort-de-France, Martinique despite calls by numerous French officials for his burial at The Pantheon. If you’d like to add any, please leave a comment.